The dazzling colours and great food of Greece's famous islands extend to these lesser-known sand-fringed destinations, which boast wonderful places to stay – especially for late- or out-of-season breaks by Andrew Bostock. Despite its many crises in the past few years, tourism is booming in Greece. Most travellers, however, still rarely venture beyond the more famous islands - and a little exploration is all that is needed to take you to some lesser-known gems. Here are 20 of our favourites. All accommodation prices are for a double room in low season and include breakfast, unless stated otherwise. In most Greek tavernas you can eat and drink well for €15-20pp, but if a place is more expensive, I have indicated this. Lemnos. Mainly visited by Greeks, its size and large population mean that Lemnos (aka Limnos) avoids becoming simply a tourist destination. The capital, Myrina, is a working fishing port and you will still see fishermen mending their nets by the harbourside. Its low coast has several great beaches. What to do Perched on a headland above the capital is a large, 13th-century Venetian castle, now inhabited by wild deer. The spectacular view stretches as far as the monks’ republic of Mount Athos on the mainland. Where to stay The Arxontiko (€70, ) was Lemnos' first hotel and is still one of its best, mixing a traditional guesthouse with modern boutique style. It is in the centre of Myrina, but on a quiet side street and a short walk to the beach. Where to eat Grammofono (on Facebook), on the main square by a taxi rank, is not in the best location, but this little meze bar takes its food seriously and is great value. Try a seafood pikilia, or mixed plate – calamari, shrimps, mussels and various small fried fish. There is often live music in the evenings. Ikaria. The island owes its existence to Icarus’s plunge into the sea after the wax of his wings melted. Ill-fated people have been visiting ever since – it was a place of exile for left-wingers during the civil war and the Colonels’ dictatorship. Don’t let this put you off; the locals revel in their quirky reputation and the varied landscape rewards exploration. What to do Talking of quirky, how about bathing in radioactive hot springs? Apparently, this is actually beneficial to the health – researchers are exploring whether this is the reason for the islanders’ legendary longevity – and can be experienced at several bathhouses. Where to stay Toxotis Villas (from €110) is a group of seven gorgeous villas, which combine a fantastic location with luxury, privacy and a traditional style. Where to eat Thea’s Inn is a proper Greek taverna in the pretty village of Nas, focusing on local food, including meat and vegetables from the owners’ organic farm. Ammouliani. Nestled between two prongs of the Halkidiki peninsula, this small island has great sandy beaches and is a welcome relief from some of the bigger resorts on the mainland. Most visitors are Greek and it retains an authentic atmosphere. What to do Boat trips around Mount Athos can be arranged, which is the closest most of us will get to this male-only monks’ republic. It is well worth having a peek – the cliff-hanging monasteries are spectacular. Where to stay If you are young and/or adventurous it is perfectly possible to bring a tent over to Greece and camp – nights are warm, campsites are well-equipped, and most sites are right on the beach. Try Alikes Camping (pitches from €5 per tent, plus €5 each per adult). Where to eat Tzanis is a seafood taverna right by the water. The clams are particularly good. Meganisi. This small island consists of only three villages and a population of just over 1,000. Just across from popular Lefkada, it’s not usually considered a destination in its own right, and is mainly visited on day trips. Staying on the island means you can explore its many “hidden” coves at your leisure. What to do There is much debate as to which beach is Meganisi’s best. Most can only be reached by foot or by boat, so it will take you a while to review them all. Limonari, with its isolated clean sands, would be in most people’s top five. Where to stay Tucked away in the winding alleys of Spartochori, The Teacher’s House (studio from €65, family apartment from €100) has been expertly renovated, and split into a studio and two apartments that share a small pool. The contemporary interior design gives a light and airy feel. Where to eat Lakis Taverna is a solid, family taverna at the heart of the village. Its “Greek Night” on Thursdays is great fun, but may not be everyone’s shot of tsipouro. Antiparos. Paros is well known, but relatively few make it to the island opposite. For those in the know, including a fair few celebrities, Antiparos provides a relaxing haven in this often busy group of islands. What to do The large cave in the centre of the island is awe-inspiring, but be warned, there are lots of steps. Where to stay On its own sandy and sheltered cove, Beach House (€80) is a stylish little hotel, with good-value small rooms for couples, but try to splash out for their larger rooms, including family suites. It also has a great restaurant, lots of family-friendly beach activities and a massage service. Where to eat Two good signs to look for when hunting down a seafood taverna are octopus hanging out to dry outside, and the ability to toss your olive stones and fishbones straight into the sea from your table. Captain Pipinos is a win on both counts. Kythnos. Its proximity to Athens, fabulous beaches and famous thermal springs mean that this island gets rammed with visitors – mainly Greek – in August. Come out of season, however, and it can be perfect. What to do Take a sea taxi to Kolona, a narrow strip of sand connecting to a small island. The two bays on either side have azure water which is rarely without a few yachts at anchor. Where to stay Due to its popularity, Kythnos is not the cheapest, but Xenonas Afroditi (€70) is a more reasonable option in the spa town of Loutra. And it is exactly what you expect from a Greek hotel: whitewashed, simple rooms, and by the beach. Where to eat Chartino Karavi (+30 22 8103 3004) is a reliable little tavern on the backstreets of Dryopida, a pretty inland settlement. When it’s not too hot there is a footpath that winds the 2km up to here from the island’s capital, Hora. Serifos. Serifos’s main town, Hora, is one of the most picturesque in Greece, its whitewashed cubes clinging to the side of a mountain. Its aspect is one reason so many artists choose to settle on the island. What to do Livadi, the port town, is a pleasing throwback to what the Greek islands used to be like. Its heart is the grandly named Yacht Club, in fact an old-style kafenion. It is the ideal place to sip a Greek coffee and chat to the locals. Where to stay Apanemia (€40) is an old-fashioned rooms-only place in Hora. It’s nothing fancy, but clean, well-cared for and at the centre of this lovely town. Where to eat To get the most out of Serifos you need to hire a car and explore – you’ll certainly need one if you want one of the island’s best food experiences. Aloni taverna could trade on its great views, but its local food is also excellent – try the slow-cooked goat, or mastelo saganaki, a fried goat’s cheese similar to halloumi. Sifnos. This is another island that, while relatively unknown to Brits, is an achingly trendy destination for the Greek set. It can get crowded, but the atmosphere is authentic and it has a culinary reputation – one of the first famous Greek chefs, Nicholas Tselementes, came from here, and it still attracts the foodies. What to do Sifnos has a fantastically well-maintained and mapped selection of hiking trails to suit all levels of fitness. An excellent guidebook is available locally. Where to stay The main town, Apollonia, is where the trendy go to see and be seen, wandering up and down the Steno, its buzzing, narrow main street. Surprisingly close to this, but hidden in their own peaceful olive grove, are the Eleonas apartments and studios (€65). Where to eat Rambagas is the smart spot to experience local food mixed with the latest on-point experiments. Start with a sea-bass tartare in traditional lemon and oil sauce, and end with chilled melon soup for dessert. The setting, just off the Steno, is gorgeous too. Folegandros. Folegandros has similarly dramatic cliffs and hillsides to the magnificent volcanic landscape of Santorini, and is far less visited. What to do The main town, another Hora, perches on the cliffs, and wandering around its pedestrianised centre from square to square beneath the bougainvillea is what Greek dreams are made of. Where to stay Everything about the chic Anemi Hotel (from €153) is blindingly white, from the walls to the decor. But it is also surprisingly family friendly, with babysitting, a playground and even a kids’ cinema. The adults will be kept happy by one of the best bar/restaurants on the island. Where to eat Some dishes at Blue Cuisine sound a little over the top (deconstructed Greek salad with “feta sushi”? ), but the local ingredients, including cheeses and cured meat from the surrounding islands, are superb. Amorgos. This dramatic island does have good beaches, but is better known for its hiking and diving (French film The Big Blue was shot here). What to do The extraordinary whitewashed monastery of Hozoviotissa, which dates back to the 11th century, clings to the cliffs of the dramatic south coast. It is well worth a stiff climb up many stairs to reach it (but if you’re not modestly dressed the monks will send you straight back down). Where to stay Decorated in classic white and blue, Emprostiada (from €50) is a comfortable guesthouse at the edge of the island’s main town (inevitably named Hora). Out of season, the rooms are a real bargain. Where to eat The green tables and chairs of Tranzistoraki fill a little side-alley in the main town. The cute setting is matched by some interesting local food and a good selection of meze. Koufonisia. Actually made up of three islands, although only one is inhabited, Koufonisia is increasingly a destination for Greeks, including many who camp on the amazing beaches here during the summer, inspiring a laid-back 1960s vibe. The locals take it in their stride, and many of the 400 or so still fish for a living. What to do Take a boat ride to the other two islands. Kato Koufonisi has the best beaches, and dramatic Keros was where many of the finest early Cycladic statuettes were discovered – now to be viewed in Athens, these inspired artists such as Picasso and Brancusi. Where to stay Those who like living in the round will love Windmill Villa (€295, breakfast not included, sleeps 4), an expertly renovated windmill in an idyllic location. It’s a little cramped on the inside, but its charm is hard to resist. If your budget doesn’t stretch to that, Michalis Little Houses near the port has simple two- and three-bed rooms with bay views from €75. Where to eat Given that Mixalios Grill House (on Facebook) doubles up as the island’s butcher, it is unsurprising that meat is the order of the day. Try the goat. Schinoussa. With a population of around 250, this island rightly describes itself as a “small paradise” and the atmosphere is suitably chilled out. The only settlement is a one-kilometre walk above the little port, but most hotels will meet you off the ferry. What to do Beaches, and walking to them, are pretty much the only activity on the island; but locals claim to have 18 of them hidden away, so there’s plenty to keep you occupied. There is a boat tour as well, for the lazy. Where to stay Meltemi (€50) has simple rooms set in a nice garden, and a friendly atmosphere. Where to eat Deli Restaurant and Bar has a cool bar downstairs, and chic restaurant upstairs – and a surprisingly sophisticated take on Greek food for such a small island. Tilos. Along with some of the larger Dodecanese, Tilos is greener and more lush than many Greek islands, and is renowned for its wildlife, from flowers to birds. Its gentle landscape rewards hiking, and it offers small villages and unexploited beaches. What to do If you want to get away from the beaches, the ruined medieval capital of the island, Mikro Horio, is a fascinating place to explore, and a not unreasonable hike up into the hills above Livadia, the port. Where to stay Friendly, family-run Eleni Beach Hotel (€90) has whitewashed, simple rooms and its own beach. Where to eat Everything about Tilos seems to belong to a Greece of 20 years ago, and Omonoia cafe doesn’t seem to have changed in those years. Its gigantes (giant beans) are particularly famous. Halki. 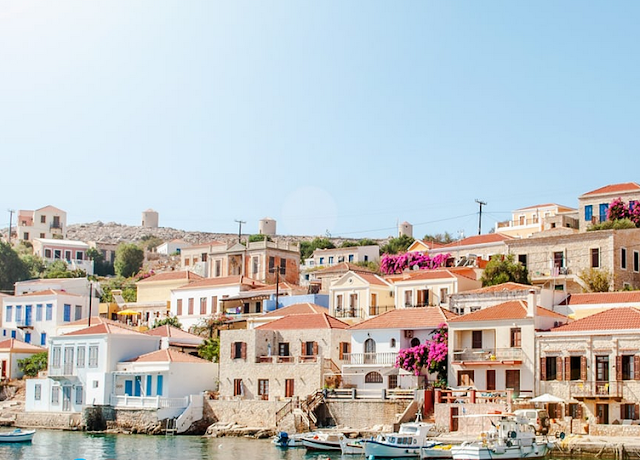 Halki is one of those islands you fall for instantly. Arriving in its main town and port of Emborio, you immediately notice the many 19th-century mansions that bear testament to the island’s history as a thriving fishing and merchant capital. Its sleepy atmosphere makes exploring a delight. What to do The interior of the island is capped by a castle built by the Knights of St John, which perches above the ruined remains of Horio, once the capital. Where to stay Halki doesn’t have many hotels. Try the Captain’s House (€50, +30 69 3251 1762) or villa options with Nissia Holidays. Where to eat Pondamos is perhaps Halki’s best beach, and the fish at Nick’s Taverna makes a trip here doubly worthwhile. If you have lunch, they may well let you use their beach chairs and umbrellas free. Patmos. Those who know their Bible will tell you that it was on Patmos that St John wrote the Book of Revelation. Thus the island gets many visitors – some of them genuine pilgrims, and many just curious tourists from huge cruise ships. Few stay, however, and fewer still venture further than the central monasteries – a shame, as the island abounds in good beaches, and the interior is a rural idyll. What to do You must walk up from the port to see the monasteries. One contains the cave where St John received his visions, and the top one is impressively fortified against pirates. Where to stay It is much more atmospheric to stay in the old town surrounding the monasteries than down in the port. Although not cheap, the five rooms at Archontariki (€200) have the air of an authentic village house, rather than a hotel. A cheaper alternative, but near the port, are the Kalderimi Studios (from €50). Where to eat There are a few options in town, and plenty more down at the port, including some fine dining, but it’s worth going out to Lambi beach, where the pebbles are backed by the traditional Lambi Taverna (+30 22470 31490). A great spot with food to match. Karpathos. Despite being the second largest of the Dodecanese – smaller than Rhodes and bigger than Kos – Karpathos has been inexplicably neglected by tourists. Admittedly Pigadia, its main town and port, is not as immediately pretty as some, but stay awhile and its old-fashioned atmosphere grows on you. From here, hire a car and explore the island’s low-key resorts and rugged interior. What to do Visit the village of Olympos, high in the mountains, where the women dress in traditional costume and back alleys wind past pastel houses to amazing views. Where to stay The perfect little resort of Lefkos boasts a sandy sweep of beach and several relaxed places to stay and eat. Le Grand Bleu (€60) is one of the most comfortable. Where to eat Back in Pigadia, Ellinikon is an old-school taverna. Feel free to look into the various pots that will be bubbling, and discuss today’s specials. Telendos. Essentially little more than a mountain rising out of the sea by the island of Kalymnos, and reached from there by a 10-minute boat ride, Telendos’s chief attraction is its complete lack of cars, or indeed roads. Most people visit just for a day trip, but it’s a perfect place to chill out for longer – the three beaches and six tavernas (all excellent) will keep you occupied. What to do Despite its diminutive proportions, there is plenty to explore on the island, with various small ruins to find – of a Roman town, a castle, a couple of early Christian basilicas, etc. There is also a burgeoning rock-climbing scene. Where to stay George and Poppi are justifiably proud of On The Rocks (studios from €40, rooms from €50), which includes a taverna and a few simple rooms. And they are a mine of local information. Where to eat All the tavernas are a good bet. Zorbas is fish based, generally caught earlier on that day by the owner, who often takes guests out with him on his boat. Lipsi. Locals will tell you this small island (just 8km long) got its name because this is where the beautiful nymph Calypso detained Odysseus, delaying his trip home to Ithaka, and his wife Penelope, by several years. It is certainly a good place to while away some time. The one village settlement is pretty and there are some great beaches to explore. What to do Perhaps the best of the beaches is Hohlakoura, with its bright white pebbles and interesting rock formations. It’s a little difficult to get to, with the only road being a bit rough, so there are boat trips instead. Where to stay Just a short walk from the town, Nefeli (studios from €60, apartments from €75) is a classy boutique hotel set above its own strip of sandy beach. Nice and peaceful, but near enough to the centre of things. Where to eat Pefko taverna has an enviable location right on the sea, and the food matches the view. Nikos, the owner, is from one of the oldest families on the island, and is sure to come over to your table for a chat. Leros. Leros has everything going for it. It is big enough to explore and there are plenty of whitewashed villages and enchanting coves. Fortunately, it has escaped the large-scale development of some islands, and the resorts are low key and charming. What to do The island’s main town of Platanos is just 10 minutes’ walk above the port, and is well worth exploring, with its backstreets peppered with large mansions, now often in disrepair. Above the town is a row of picturesque windmills and an imposing fortress. Where to stay The long, sandy beach and blue waters of Alinda make one of the island’s most appealing mini-resorts. A few minutes’ walk from the beach is Archontiko Angelou (€50), a gorgeously restored 19th-century villa, which is like stepping back in time. Where to eat The cove of Dio Liskaria is tucked away at the north end of Alinda, and is the best place to swim on the island. Luckily the food at Vareladiko is pretty good too. Agistri. Only a short hop from Athens, this little island is to be avoided in high season (July and especially August, when all of Greece is on holiday), but in the quieter months is a fantastic place to visit, especially in combination with a city break in the capital. It is also not far from the famous ancient ruins of the Peloponnese. What to do Chilling out is the order of the day, but kayaks are available to hire and a circuit of the island is possible if you are particularly energetic. Where to stay Rosy’s Little Village (doubles from €68) feels more like a community of friends than an impersonal hotel. Perched above the sea, on multiple levels, it has its own swimming platforms and sandy beach. Where to eat A string of restaurants and small hotels lead out of Skala, the island’s bustling main port. Gistri, a fish taverna, has a great location by the pebble beach, and reliable food. These lesser-known islands are surprisingly easy to get to. Some of the larger ones have airports and can be reached by charter flights in season, as well as scheduled airlines (such as easyJet, Ryanair and BA), and domestic flights from Athens and Thessaloniki. All of the islands can be reached by ferry from Athens’ port of Piraeus (although Lemnos, for instance, is a 20-hour ride). Most islands are within two hours’ ferry ride of a hub island. Arriving by ferry at an island is the best way to start to get to know the place, and by ferry you could combine two or three islands in one trip – proper, old-school island-hopping.